When you think of someone who partakes in wine tastings on the regular, who comes to mind? Perhaps you drum up an image of someone with a great deal of wine knowledge, able to detect hints of pear, oak, leather, or the area of the world where the wine is from with a simple sniff, swirl, and sip of the liquid. Someone who has a special fridge full of expensive wines, who always knows which wine to pair with any dish. Well, I am here to prove you wrong. I can’t really do any of those things, but I love going to wine tastings. The waiter poured a small amount into my glass, and then patiently waited for me to taste it. I, in turn, picked up the glass, gave it a meager swirl (I had seen that on TV somewhere,) and then slammed the wine sample in one gulp. “Yep, that’s great,” I said, as the waiter stood there looking kind of stunned. I had no idea one was supposed to sniff and swish and savor the sip to truly take it all in before finally swallowing and making a decision. What for? At that point in my life, I had rarely met a white wine I wouldn’t drink, even if it wasn’t spectacular. I mean, I was regularly buying Two-Buck Chuck from Trader Joe’s. What did I know? Throughout my 20s, I rarely ventured far from the type of wines I enjoyed: Riesling. Gewürztraminer. Moscato. Prosecco. The rare Chardonnay, Pinot Grigio, or Sauvignon Blanc. I tended to avoid reds as a whole, as they were served at room temperature (wine should be cold), often left me with a headache, and always made me think of blood. (I read a lot of vampire novels as a young adult). Also, the first red wine I had tasted outside of church wine was Merlot, which I found abhorrent, and it tainted my entire view of the genre. I avoided rosé as well, because my mother favored White Zinfandel and I didn’t think it was very good. In truth, the color made me think of wine coolers or Boone’s Farm and I’d had enough of those between ages 18-21 to last me a lifetime. However, these last few years, I’ve opened up my mind and my mouth to all sorts of different wines, including rosés and reds. 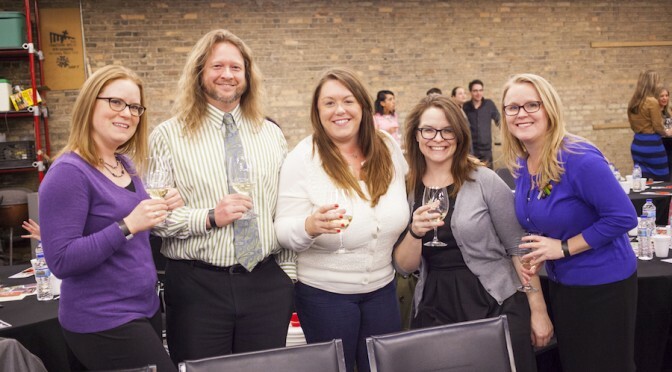 I attribute this to two things: a number of visits to nearby wineries and participation in New Vintage, a monthly wine tasting experience for those in their 20s and 30s, hosted by Minnesota Monthly and Solo Vino. I’m a huge fan of visiting vineyards. I mean, what’s not to like? You pay a flat, reasonable fee and you get to try a lot of different kinds of wine. I haven’t made it to Napa Valley yet, but I always try to visit Midwestern vineyards whenever I’m on road trips with friends. I’ve been to Northern Vineyards in Stillwater a few times, as it’s not very far from my home. After completing the tasting, you can buy a glass or a bottle (which they’ll open for you) and take it up to their lovely deck overlooking the St. Croix river; you can even bring in snacks to enjoy with your wine. My favorite of theirs is Oktoberfest, as it’s very reminiscent of Riesling. One road trip let me to two wineries; Spurgeon Vineyards in Highland, Wisconsin and Galena Cellars in Galena, Illinois. While most of this trip is a blur (wine consumption was high), I purchased two red wines from Spurgeon to save for the holidays: Wisconsin Cranberry for Thanksgiving, and Winter Spice for the Christmas season. Turns out I’m a sucker for holiday wines, especially featuring cranberries. My favorite vineyard experience to date, though, has been at the Maiden Rock Winery and Cidery in Stockholm, Wisconsin. I’ve been there the last two springs in a row and it’s a delight, and not just because it combines two of my favorite beverages in one place. The owners, Herdie Baisden and Carol Wiersma, are fantastic and welcoming, their employees are delightful (shout-out to Bob), and their wares are stellar. It’s not all wine and cider, either. They’ve got mustards, jams, butters, and other delicious items to purchase that have found their way home with me. Both times I’ve visited, we have far exceeded the amount of wines and ciders usually offered at tastings; they’re very generous! (How very Wisconsin of them!) And while I am a big fan of their Honeycrisp Hard Cider, I’m also very fond of the wines they offer, not just from their winery, but from other parts of the state. It is here that I found Cedar Creek Winery’s Settlement Gold (white), as well as Von Stiehl’s Cherry Blossom Blush (rosé). Both are perfect for summer (remember summer? ), as they are fresh, sweet, and make me immediately think of drinking on patios once opened. In 2013, I started attending New Vintage with a group of friends. I cannot recommend it enough, and that’s not just because of the generous pours. Every month brings a new lineup of wines and a new venue to visit, all for $20. Chuck Kanski from Solo Vino chooses and talks about the wines, offering up tips and tricks to get the full enjoyment out of the beverage. I’d like to say that my wine aptitude has increased significantly from these lessons, but if it has, it can only be measured microscopically. I’m still not entirely sure what I’m supposed to be deciphering during a tasting. My expertise seems to be limited to those wines I never want to drink again: Merlots, French wines that taste of sadness, that one Rosé that tasted like motor oil. However, New Vintage is largely responsible for increasing my love of rosés and discovering that there are actually reds out there that I enjoy: Kirchmayr Zweigelt, a pleasant sipping red from Austria that is neither too heavy or too dry, and the sweeter Quattro Mani Montepulciano d’Abruzzo, which is Italian. This wine club also is credited for me learning that great wines don’t have to be expensive, as there’s rarely a wine that Chuck offers that sells for over $30. Savvy, huh?